The fourth and final TAPAS review meeting takes place on November 6, 2014 in Augsburg, Germany. The European Commission agreed to extend the TAPAS project by three months to present the project at the AUTOMATICA 2014 fair in Munich, Germany. The third experimental evaluation of TAPAS takes place November 11-15 at the Grundfos site in Bjerringbro, Denmark. The third TAPAS review meeting takes place on June 11, 2013 in Augsburg, Germany. The second TAPAS review meeting takes place on March 13, 2012 in Oberpfaffenhofen, Germany. The first TAPAS review meeting takes place on May 20, 2011 in Augsburg, Germany. The TAPAS kick-off meeting takes place on November 18-19, 2010 in Aalborg/ Bjerringbro, Denmark. The TAPAS project starts on October 1, 2010. The overall objective of TAPAS is to break new ground in robot-based automation and logistics as the backbone of a transformable factory of the future, enabling an economic production regardless of changes in volumes and product type. Today’s production systems are either fully automated or strictly manual. While the former is very efficient in high volumes, but less flexible, the latter is very flexible and allows short changeover times from one product to the next, but is less cost-efficient, especially in higher-wage countries. 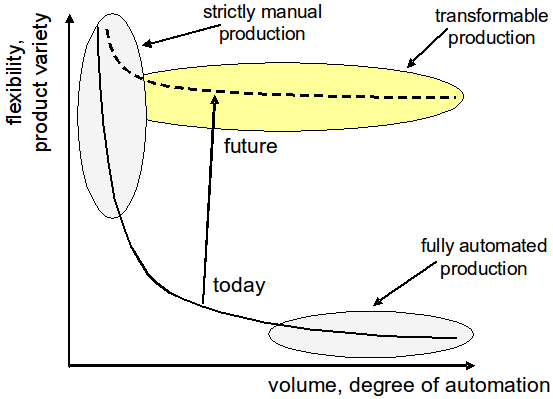 The vision of TAPAS is a transformable production that combines the best of both worlds by using new assistive automation and mobile robots as well as a variable degree of automation yielding high flexibility and product variety at both low and high volumes (see figure). TAPAS pioneers the following tasks in real production environments: mobile robots with manipulation arms will make logistic tasks more flexible and more complete by not only transporting, but also collecting the parts needed and delivering them right to the place where needed. Since moving parts around the shop floor does not create value by itself, TAPAS robots go even beyond: they will automate assistive tasks that naturally extend the logistic tasks, such as preparatory and post-processing works, e.g., pre-assembly or machine tending with inherent quality control. Through this additional creation of value and by a faster adaptation to changes with new levels of robustness, availability, and completeness of jobs TAPAS robots promise to yield an earlier return of investment. To reach the objectives, the TAPAS consortium will iteratively test and validate the developments with two pilot installations of increasing complexity and scale. The drivers behind TAPAS are a robot manufacturer and a system integrator, providing both their production environments for intensive testing and validation, and a software technology provider. Teaming up with three research partners they will develop logistic and assistive robotic solutions for transformable automation that are generally applicable and scalable.